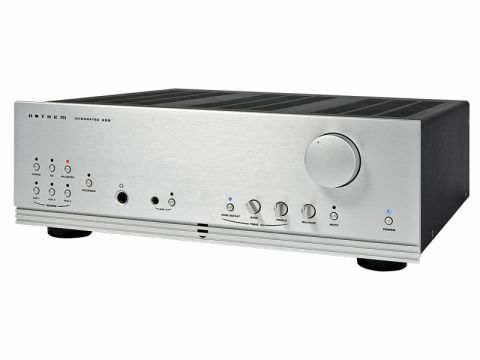 The product we're reviewing here is the Anthem 225, a solid-state integrated amplifier, that is said to deliver 225 watts per channel into an eight-ohm load. The Anthem 225 is well-equipped and even includes a MM phono stage. This might seem like a good thing, but as it is a component with high-end aspirations you might be tempted to ask why? It's hard to think of any moving magnet cartridges that truly qualify for high-end status. Similarly, the inclusion of tone controls (albeit accompanied by a tone-defeat button) seem out of place, especially on an amplifier that features a balanced input. There's a sense here that one hand is giving, while the other is taking away, or that the design simply wants to be all things to all men. It also incorporates a 12V trigger input/ output, an IR receiver in and out and an RS-232 interface to allow it to communicate with custom control systems, all of which suggest that it could find its way into an intelligent home set-up just as easily as it might be included in an audiophile system. The 225 also comes with a programmable, learning remote control handset, already set-up with IR codes for a host of international – for which read predominantly North American – ancillary devices. Fronted by the new Naim CDX2 CD player and a Cambridge Audio DacMagic driving a pair of NEAT Momentum 4i loudspeakers, the Integrated 225 turns in a musically rewarding performance. It sounds particularly rhythmic, sprightly and surefooted when playing Albert Lee and Hogan's Heroes' Like This album. Lee plays an Ernie Ball Music Man guitar, for instance, fitted with low-slung, single-coil pickups that give it a distinctive wiry tone with loads of bite and attack. The Anthem flawlessly portrayed the guitar's clean, vintage tone and character with crisply defined, but not exaggerated leading edges. The rhythmic dexterity of the amplifier comes to the fore playing The Specials' Monkey Man track from the 30th Anniversary Tour CD. It clearly relishes the syncopation and demonstrates clearly how the bass and drums work together to create the distinctive, two-tone rhythms that feature on every track. Nobody could ever accuse this amplifier of complacency or being laid-back: it demonstrates a vivid enthusiasm for upbeat music. Equally, it is musically revealing, a facet that is highlighted by its portrayal of the timbral qualities of Deborah Harry's voice, vividly contrasting the abandon and sheer exuberance of her early days in Blondie with the rather more languid, almost jazzy presentation of her later years. The same is true of its presentation of Van Morrison's vocalizing, in which his increasing maturity from album to album is markedly evident in his timbre and his delivery. The Integrated 225 shows that Anthem clearly understands what is important in portraying music: but maybe it is not so clued up about UK market sensibilities. Regardless, it is still a fine attempt to woo British buyers.